This was said by Pangasinan Sports Development and Management Council (PSDMC) Executive Officer Modesto M. Operania, representing Governor Amado I. Espino, III during the 8-bout match of the Philippine Sports Commission (PSC) – Pacquiao Amateur Boxing Cup Luzon Semi Finals in partnership with the Provincial Government of Pangasinan on April 9 held at the Capitol Beachfront in Lingayen. Photo from Pangasinan Government Facebook Page. Twelve competing teams from different provinces of Luzon namely Camarines Sur, Camarines Norte, Sorsogon, Tuguegarao, Baguio, Mandaluyong, Laguna, Pili, Bulacan, Tayabas, Olongapo, Iriga slugged it out in the boxing competition organized by the PSC, and the Office of Senator Emmanuel “Manny” Pacquiao which aims to produce future boxing champions for the country. 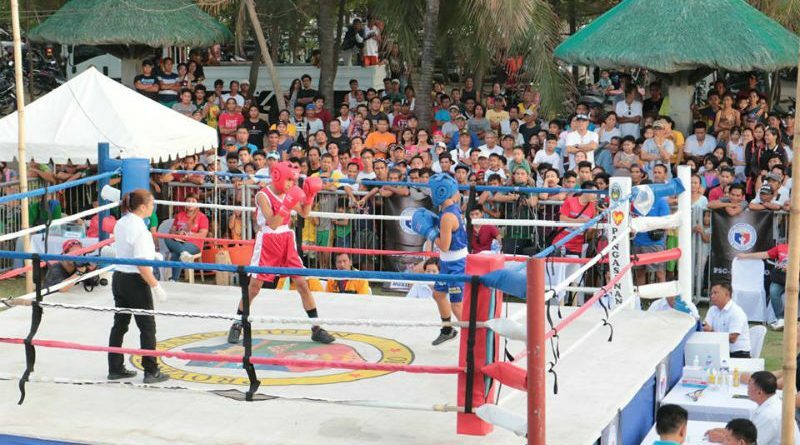 Addressing the participants and the spectators, Operania bared that Pangasinan, despite hosting the event have no representatives due to failure to receive the invitation for the scheduled elimination rounds of the Boxing Cup which was launched on December 14, 2017. Operania assured that the province is ready for the next season, stressing that Pangasinan is home to talented athletes and boxers as showcased by the province’s Palarong Pambansa 2018 boxing delegates who were recently sent off last April 5. 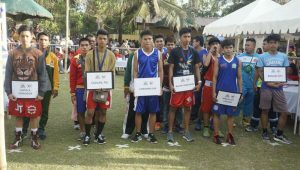 Winners of the boxing cup are: Jr Boys Pin Weight (44-46kg) – Jeyron Tiger Villamor (Camarines Norte); Jr Boys Light Fly Weight (48kg): Jovanie Boyones ( Binan, Laguna), Jhunmil Guban (Bulacan); Jr Boys Fly Weight (50kg): Lorenzo Roa Jr (Iriga), Alexander Almacen (Binan, Laguna); Jr Boys Light Bantam Weight (52kg): Renzo Ruiz Abayon (P.Sor), Remart Gomez (Mandaluyong); Jr Boys Bantam Weight (54kg) Frenzle Allen Golocan (Baguio), Dave Asi Laurejas (Mandaluyong); Youth Boys Light Fly Weight(46-49): Darwin Boyones (Binan, Laguna), Eddie Mapusao (Camarines Sur); Youth Boys Fly Weight (52kg): Junel Miranda, Ventura Dumaguit (Mandaluyong); Youth Boys Bantam Weight (56kg): Jeves Espino (Olongapo), Nicolas Inocencio (Mandaluyong). Winners of the boxing cup semi-final round will move forward to the Luzon Championship round which will be held on June 2, 2018 in Baguio City.